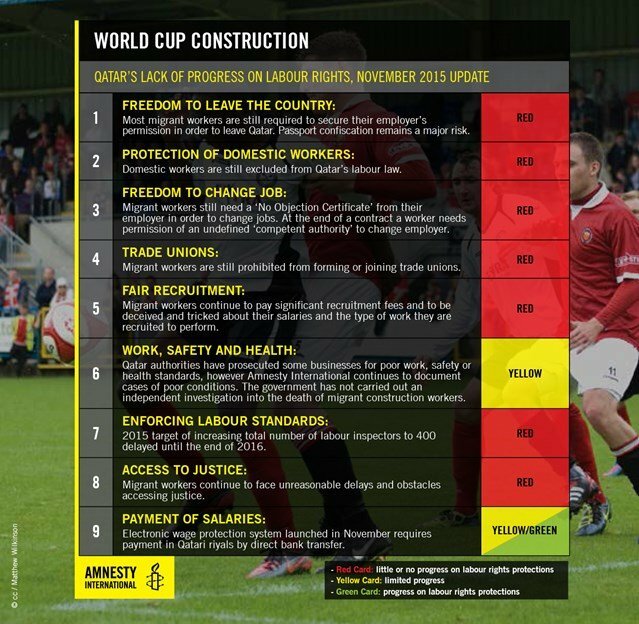 On the fifth anniversary of Qatar’s nomination to host the World Cup, Amnesty International released an update on Qatar’s failure to implement significant protections for migrant workers. Qatar’s response included its routine claim to prejudice, sandwiched between stale reassurance of its appreciation for the migrant workforce and indefinite pledges to progressive reform. Conducting research in Qatar over the past your years, Amnesty has tracked the lack of progress on 9 key labor rights. Amnesty’s report did recognize that some progress has been made in two areas - work, safety, and health, as well as payment of salaries. In an official statement, Qatar has deflected criticism, arguing that report should have compared conditions with those of other countries employing large numbers of migrant workers - i.e., other countries in the GCC. It mentions Qatar's progress in cooperation with sending countries, increased monitoring of recruitment agencies, an electronic complaint system, and impending restructuring of the Kafala system - the latter of which has received criticism for its insufficient reforms and slow implementation. Recent cases in Qatar demonstrate that these ‘achievements’ are incomplete, as many migrant workers still face exploitation from recruiters and employers, and are still barred access to justice. The organization also called out FIFA for failing to use its leverage to push for better working conditions on world cup construction sites. “FIFA has bent over backwards to make a Qatar World Cup work, even taking the unprecedented step of moving the tournament from summer to winter. But apart from occasional public statements the organization has not set any clear, concrete agenda for how it will push Qatar to ensure migrant workers’ rights are respected,” said Mustafa Qadri. Much like Qatar, FIFA responded with appeasing but empty rhetoric about its commitment to workers’ rights, sidestepping any concrete refute to Amnesty’s findings . Amnesty International has released a statement summarising their reporting on labour conditions in Qatar over the course of the past five years. The Government of the State of Qatar feels that Amnesty’s statement does not accurately reflect the progress we have made in reforming our labour system. Further, the Government feels that Amnesty’s reporting lacks context, as it does not benchmark labour conditions in Qatar against labour conditions in other countries facing similar challenges. Qatar fully intends to meet the highest standards with regard to labour but for reasons that are unclear, Amnesty International has provided no comparative data on labour conditions in other countries employing large numbers of guest workers to meet the demands of rapid growth and development. The Government of the State of Qatar wishes to reaffirm its appreciation for the contributions made by the millions of workers who have come to Qatar in recent years to help us build our nation’s infrastructure and we are committed to respecting both their labour rights and their human rights. Qatar is committed to protecting the workers who are helping us build our nation. Indeed, this is why we welcome feedback and constructive criticism from NGO partners. But with regard to Amnesty’s most recent statement, we feel that the accusation that Qatar has failed to improve the human rights of its guest workers is simply untrue. Significant reforms have been made and more are in the pipeline. The Wage Protection System to ensure workers are paid in full and on time is in place and is being enforced. All employees of private companies in Qatar must now receive their wages electronically via bank transfer within seven days. Qatar has introduced and enforced new laws that make it illegal for companies to withhold workers’ passports; make it illegal to work during midday hours during the summer months; increase the minimum accommodation space per worker by 50 per cent; and improve health and safety requirements for all workers in Qatar. Qatar has also put in place stronger regulations to safeguard workers’ welfare, and has improved access to justice for those suffering unfair treatment; an electronic complaint system now operates in 10 different languages, including, English, Arabic, Urdu, Hindi, Tamil, Bengali and Nepali. To address the issue of unfair recruitment practices in workers’ countries of origin, Qatar has licensed over 200 recruitment agencies that are subject to regular monitoring and checks to ensure compliance with recruitment standards. To address the issue at it source, we continue to cooperate with origin country governments, and have so far signed 35 bilateral agreements and 5 Memoranda of Understanding with 40 countries of origin. The Government recently signed into law reform of the nation’s contract-based employment system, including provisions regulating the entry, exit and residency requirements for the nation’s two million-plus expatriate labour force. Labour reform is still a work in progress, but these new regulations mark the beginning of the end of the so-called "kafala" laws in Qatar. As with any government undertaking a legislative reform process, the substance of the law will determine the implementation timetable. This is a critical part of the process to ensure all stakeholders are able to comply with the new legislation. This happens in Qatar just as it does in any other country. Far from ‘tinkering on the edges’ of reform, Qatar has made, and will continue to make changes in our laws that will help ensure that the rights of both workers and their employers are respected. Our government looks forward to the release of constructive reports by Amnesty International that accurately reflect the progress that has been made in Qatar, and which benchmark Qatar’s efforts against nations facing similar challenges.